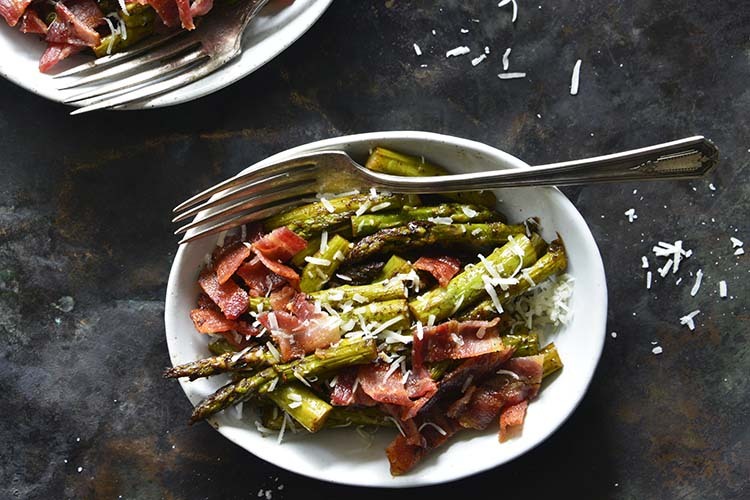 Keto One-Skillet Balsamic-Glazed Sautéed Asparagus with Bacon is the perfect side dish for spring! We look forward to fresh spring vegetables all winter, and asparagus is high up on our list of favorites. This recipe serves two, but it is very easy to double or even triple if you’re cooking for a crowd. This would be a lovely addition to Easter supper, or any spring meal. The trick to this recipe is to use a great-quality balsamic vinegar. Its flavor will permeate the asparagus as it cooks so you want something with great flavor; we like the Natural Earth Products brand of balsamic vinegar. Here asparagus is braised in chicken stock and balsamic vinegar with a hint of sweetness. Bacon adds salt and texture and Parmesan adds cheesy nuttiness. This recipe really elevates asparagus, which is already a very elegant vegetable, into something truly special. 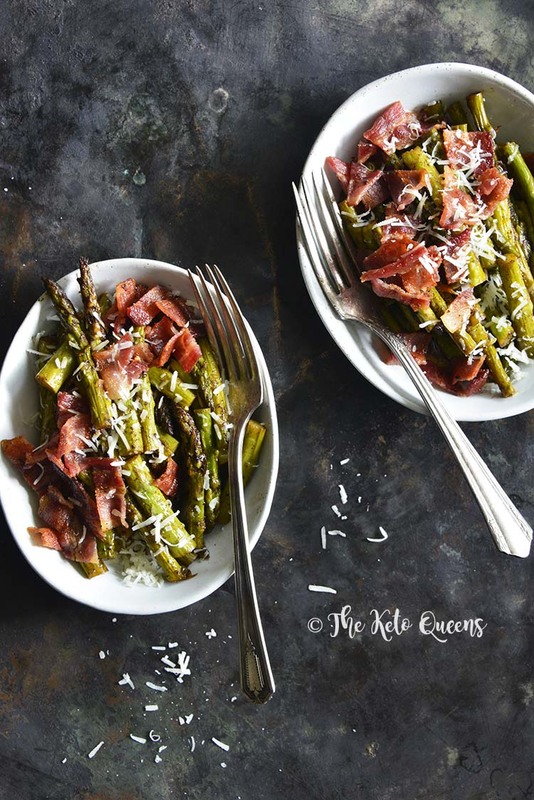 In this Keto One-Skillet Balsamic-Glazed Sautéed Asparagus with Bacon, asparagus is braised in chicken stock and balsamic vinegar with a hint of sweetness; bacon adds salt and texture and Parmesan adds cheesy nuttiness. Crisp the bacon in a medium skillet; transfer to a plate to cool, and then crumble. Add the asparagus, chicken stock, vinegar, erythritol, and black pepper to the skillet the bacon was cooked in. Bring up to a boil, and then cover the skillet, turn the heat down to medium, and cook 5 minutes. Uncover and cook until the liquid is evaporated, about 2 to 3 minutes, stirring occasionally. Transfer to a serving bowl, sprinkle the Parmesan on top, and serve. You never mention the balsamic in the recipe instructions. When/how do you add it? Alli, Yes, the vinegar is mentioned in Step 2 of the instructions. Hope you enjoy this if you give it a try!